Foolishly I believed I had a place of my own. A place that I could write and bash at a typewriter and feel productive and alive. A place of warmth, love and enjoyment while I explore the inner worlds of my imagination without persecution or fear of death. Oh my friends, how wrong was I. You see, I now live with a cat. A cat named Cookie. And may the name Cookie strike fear into your heart in the same way that the name ‘Vlad the impaler’ does, for living with a cat is a ocean of anxiety and impending doom. Cats, my friends… are known to be vicious psychopathic murderers, and I fear that it is only a question of time before my time is up. 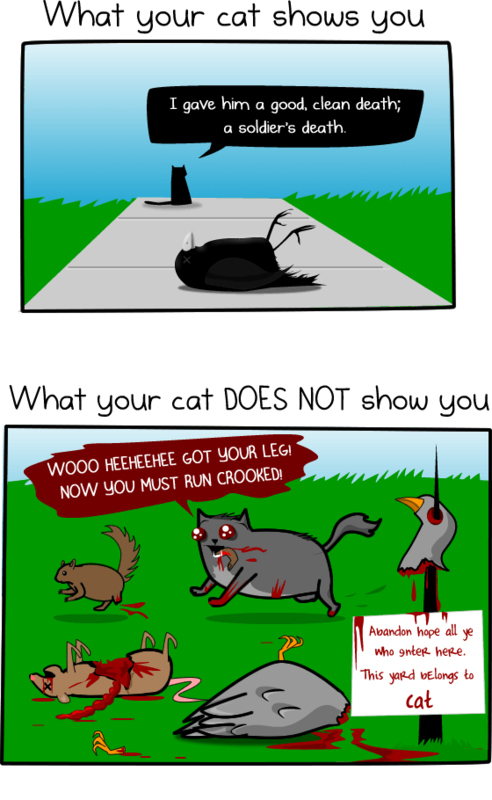 The murderous nature of cats was recently exposed in an info-graphic on the comic site ‘The Oatmeal’. The info-graphic can be found HERE, It is worth a read so that you know about the true nature of our furious furry friends. Sure, I’m bigger than Cookie by an huge factor, but this by no means guarantees that I can rest easy at night. As the Tortoise proved to the Hare, you shouldn’t take your advantage for granted. At first I thought that Cookie and I got along just fine. I fed her, changed her water, and gave her the occasional warm lap to hop onto. I even opened and closed the door to the back yard for her so she could go and check out if the ginger cat from next door had peed on her lemon plant. But this wasn’t enough. Oh no, it wasn’t. Soon she snubbed my lap and instead would just sit there looking at me with a foul expression in her eyes and her teeth bared in a threatening mood. I sat down to dinner one evening and it wasn’t long before I had Cookie sitting next to me in expectation of getting some of my food. Just for reference, She seems to like expensive cheese and freshly slaughtered cattle. On this occasion Cookie moved around behind me then started beating my spine with her tail in a series of rapid movements. Surprised by this unexpected action I sat frozen in confusion. However, seconds later I felt the piercing grasp of a left front claw trying to rip towards one of my kidneys from behind. Almost immediately after that, Cookie tried to tare with her right claw inwards to my other kidney – before she fled up stairs. Later I found Cookie sitting on my typing table, clearly asserting her dominance over my position. She Partially smothered my Triumph Perfekt in a way that implied that she could do the same to my face as I slept. Oh sure, everyone else in the house insists that I am just crazy and that Cookie really just likes me in a cat way. But I know what is going on – Cookie has played the game and made sure that before she smothers me in my sleep then rips open my jugular in order to finish me off before she consumes my kidneys for breakfast, she has everyone in the house on her side first. Cookie fleeing as I collect evidence of her dastardly threats. So I wait and sleep with one eye open while I anticipate and fear my impending doom. 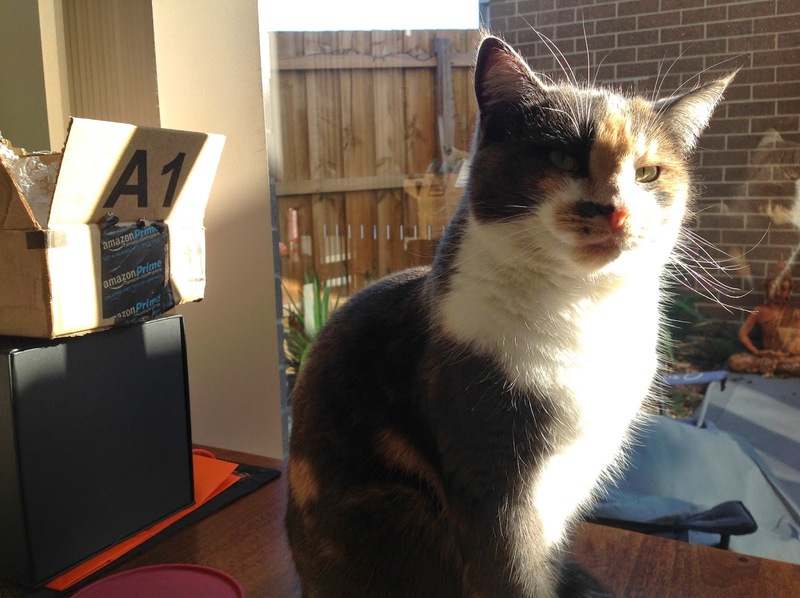 While everyone else is around, Cookie is the usual friendly and loving kitty that everyone thinks she is. But the moment they leave, she hops up on the table and gazes at me with malevolence and hunger. Yes…. with a murderous and hungry gaze…..
A “Your kidneys look delicious” Gaze. This could be the last blog I ever write. If you see a cat running around with one of my fat fingers hanging out of her mouth, please catch her and get that finger (and what is left of me) to a hospital. She’s probably trying to stop me writing and exposing her murderous intentions. Farewell….. And I hope we meet again. 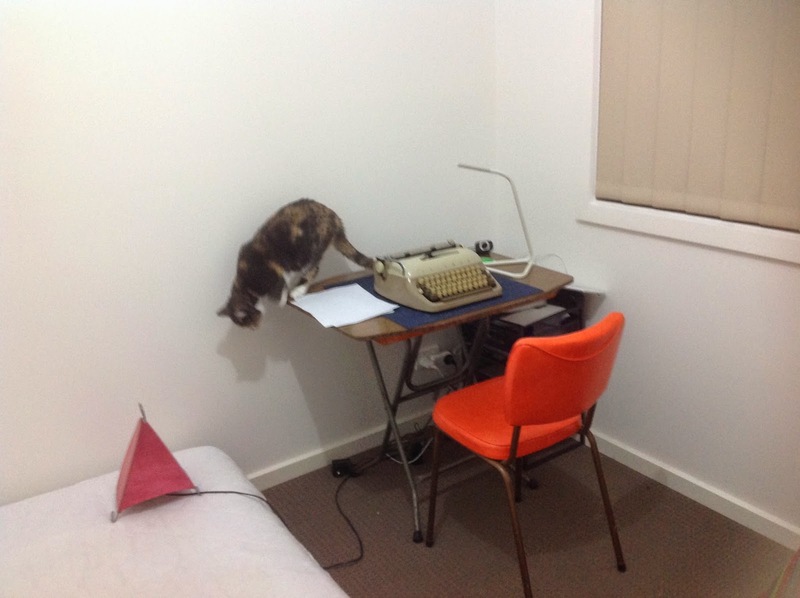 July 11, 2014 in cats, eating humans, murder cats, typewriter smothering. ← Filthy wheels – A June weekend in Wangaratta. This was funny!! Er, I hope you survive the night, I mean. that cat is bigger than your perfekt! The Oatmeal is totally right about cats, and I am a total cat person. Thanks for the laugh! Stay sharp. And carry a water pistol. ha, looks like a tortie. They're totally anti. And totally one-tracked when it comes to whinging and food. My first word was “Cookie” — and it was the name of a cat! So it's hard for me to view this Cookie in such a negative light. I have survived… But I am hiding in a corner as we speak, with a flame-thrower, fending off further attacks. Oh, and does she ever like boxes! You could be… partially right there. Quite! And she seems to be getting bigger and bigger! They do…and that's just what happens all the time. They follow me everywhere! Ha ha ha. OH! A water pistol! There's a good idea. Tell me about it. The food complaints seem never ending. Awww Richard! That's quite cute. I bet your Cookie was a beautiful cat. Now you finally know what it means to come to the dark side! Who ever knew that the dark-side purrs so nicely! Ha ha ha. I remember seeing this all those years ago! Awesome…. Thanks for the reminder! That’s a great story. I’m sure Cookie is perfectly innocent – really I do (or so my cats tell me to say). 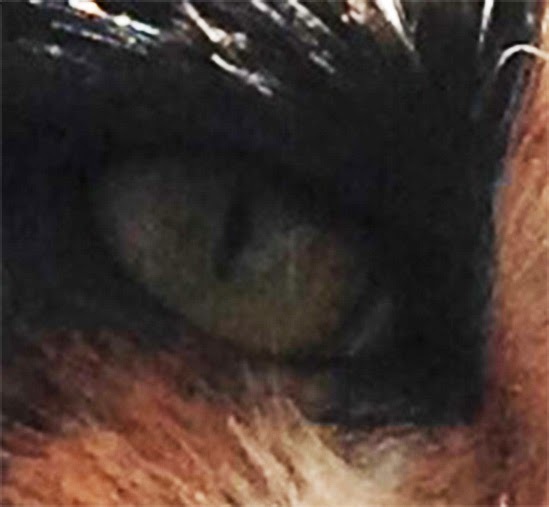 Oh dear… The cat hypno-stare has you! You’re DOOOOOOOOOMED.